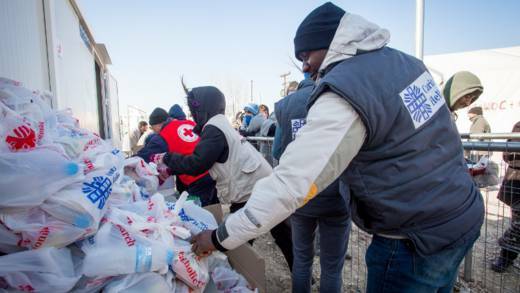 Our partner Caritas Hellas is providing food, water and cash to buy basic supplies for refugees stranded in Greece. We are living in a changing world, where humanitarian crises – whether caused by natural disasters, a changing climate, conflict or disease – are on the increase, affecting millions of people. Never before have so many men, women and children been displaced around the world. Over 60 million, more than half under the age of 21, have fled danger and poverty. They are seeking better lives, but often find little opportunity or hope when they reach their destination. Over the coming year, here are eight humanitarian situations that CAFOD will be monitoring closely. Sign up to our emergency response newseltter and follow us on social media to hear how we're responding to emergencies as soon as they happen. We continue to be inspired by the hope and mercy of the Catholic community in England and Wales. In response to the plight of refugees facing perilous journeys to Europe, over 20,000 people have taken part in our Lampedusa Cross appeal, sending them messages of hope. When we delivered these messages to refugees living in camps in the Greek city of Athens, they told us what they crave more than anything else: normality. Many of those living in the camps have been there for months. Under large canvas awnings, families have attempted to set up little areas to call home. The start of 2017 has brought freezing temperatures but no real answers for over 60,000 refugees and migrants who are still stranded in Greece, uncertain of when they will be somewhere they can call home. Some of the refugees in Europe come from Syria, which has become the worst humanitarian crisis of our time. According to the UN, the conflict has killed over 300,000 people and caused large-scale displacement, with over 6 million Syrians made homeless inside the country, and almost 5 million registered as refugees in neighbouring countries. At the end of last year, we witnessed the fall of East Aleppo and the appalling humanitarian situation people had endured because of the conflict. In December 2016, a fragile ceasefire was brokered by Russia and Turkey, however clashes and airstrikes between rebel and government forces have persisted. In a recent message, Pope Francis said that he is praying for the people of Aleppo, especially families, children, the elderly and the sick. “Unfortunately,” he said, “we have become accustomed to war, to destruction; but we must not forget Syria is a country full of history, culture and faith”. Thanks to the continuing generosity of Catholics across England and Wales, our local partners working both inside of Syria and in neighbouring countries - Lebanon and Jordan - are able to get vital aid - food, shelter and medical care to vulnerable families. Two years of conflict have pushed Yemen, already one of the world’s poorest countries, to the brink of catastrophe. A bloody civil war between the Houthi ethnic group and supporters of Yemen’s government led by President Abdrabbuh Mansour Hadi is having devastating consequences for ordinary Yemenis. The UN now estimates that more than 10,000 people have been killed since the start of the conflict, with 6,000 people killed in 2016 alone. One of the biggest impacts is that half of the population – 14 million people – is going hungry. Every ten minutes a child is dying because of preventable diseases and child malnutrition is at an all-time high. CAFOD have launched an appeal to help, and our partner is on the ground making sure aid reaches those who need it most. 2017 marks 50 years since the start of Israeli military occupation of Palestine, something which continues to be a source of instability and insecurity for both Israelis and Palestinians. The illegal occupation of land by Israel is one of the root causes of the suffering of the Palestinian people and of the injustices they face in their daily lives. We will continue to work with Christian, Jewish, Muslim and secular partners in occupied Palestinian territory and Israel to campaign for peace. 4.8 million people in South Sudan do not have enough food to meet their daily needs. Forgotten emergencies continue. Last year, malnutrition reached its highest level since the conflict broke out in 2013. The UN estimates that 4.8 million people in South Sudan do not have enough food to meet their daily needs, and are in dire need of humanitarian assistance. The Church in South Sudan continues to call on the leadership to put its people first. Bishop Eduardo Hiiboro, a partner of CAFOD, has called for unity: “For peace to prevail, we must all accept one another as brothers and sisters,” he said. “Disparaging someone based on their tribe can only lead this country down a dangerous road. Let us come together and work as one to rebuild South Sudan”. In Iraq, there are warnings that there could be more than a million refugees as the battle for Mosul, the country’s second-largest city, intensifies. As the winter worsens – bringing sub-zero temperatures in northern Iraq – a humanitarian crisis is looming. We are supporting sister agency Catholic Relief Services (CRS), who are providing emergency aid to families displaced by the battle. Set up a Direct Debit today to support our work in emergencies as soon as they hit. In 2016, political violence returned to the Democratic Republic of Congo (DR Congo) as President Joseph Kabila – who was due to stand down at the end of the year – postponed elections. The Catholic Church in the DR Congo has been an integral part of the shuttle diplomacy to bring all parties to the table to find a peaceful way forward. Our partner, Father Léonard Santedi, said: “Our deepest hope is that the current unrest won’t descend into civil war: our country has seen enough bloodshed”. In an agreement mediated by the Catholic Church on 31 December 2016, President Kabila will step down as president after elections are held before the end of 2017. Follow us on social media to hear updates about the humanitarian crises we work on. 2016 did bring us some hope. Colombia took a massive leap towards ending the longest ongoing conflict in the western hemisphere with the signing of a peace deal between the Colombian Government and the FARC guerrilla. Colombians have endured over five decades of internal conflict and whilst 2017 brings with it many challenges for the implementation of a peace agreement – including the demobilisation and reintegration of guerrillas, protecting human rights defenders from increasing attacks, ensuring access to justice for victims, and addressing the root causes of the conflict – the agreement is something to celebrate. CAFOD projects will continue to support our partners in Colombia in their tireless efforts for peace. These crises could bring us to despair, but the mercy of God’s love moves us to act. Signs of hope do emerge from the tragedy, when we see communities which faced desperate challenges draw closer to living dignified and full lives once again. Hope and mercy. Care for our neighbour. We look to these values as we consider the significant humanitarian and political challenges that lies ahead in 2017.